FRAMINGHAM, Mass., December 15, 2017 – Worldwide spending on digital transformation (DX) technologies (hardware, software, and services) is expected to be nearly $1.3 trillion in 2018, an increase of 16.8% over the $1.1 trillion spent in 2017. 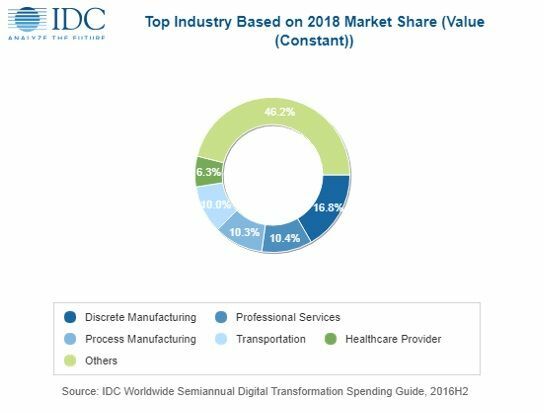 A new update to the Worldwide Semiannual Digital Transformation Spending Guide from International Data Corporation (IDC) forecasts DX spending to maintain a strong pace of growth over the 2016-2021 forecast period with a compound annual growth rate (CAGR) of 17.9%. In 2021, DX spending will nearly double to more than $2.1 trillion.